WASHINGTON (REUTERS) - US President Donald Trump said on Thursday (June 21) that North Korea was blowing up four of its big test sites and that a process of “total denuclearization ... has already started", but officials said there was no such evidence since a landmark summit took place last week. Mr Trump said at a Cabinet meeting in the White House that “they’ve stopped the sending of missiles, including ballistic missiles. They’re destroying their engine site. They’re blowing it up. They’ve already blown up one of their big test sites, in fact it’s actually four of their big test sites". It was not immediately clear which North Korean test sites Mr Trump was referring to and US officials familiar with current intelligence on North Korea’s nuclear and missile test sites said there was no evidence of new moves to dismantle any sites since Mr Trump met North Korean leader Kim Jong Un on June 12 in Singapore. The officials, speaking on condition of anonymity, speculated that Mr Trump might have been referring to explosions last month that North Korea said were to destroy tunnels at the Punggye-ri nuclear test site and the dismantling of a medium-range ballistic missile test stand at Iha-ri, also in May. There had been contact with North Korean officials since the summit, the US State Department said. USSecretary of State Mike Pompeo “will be meeting with them and talking with them at the earliest possible date” to implement what was agreed in Singapore, spokesman Heather Nauert told reporters, without providing further details. Mr Mattis sat next to Mr Trump at Thursday’s Cabinet meeting. The Pentagon did not immediately respond to a request for comment on Mr Trump’s latest remarks. There also was no immediate response from the White House. The US-based North Korea monitoring group 38 North said in an analysis at the end of last week that there had been no sign of any activity toward dismantling of any missile test site. Mr Trump, who has been leading an international drive to press North Korea to abandon development of nuclear missiles capable of reaching the United States, told reporters after the June 12 summit that Mr Kim had pledged to dismantle one of his missile installations. 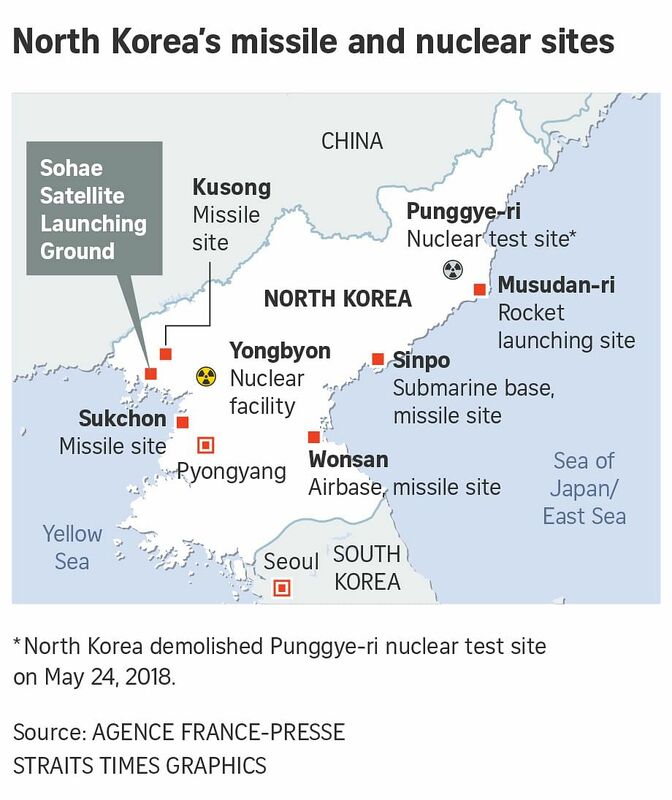 A US official said on Wednesday that the site Mr Trump referred to then was the Sohae Satellite Launching Ground, a major facility in the western part of the country that has been used for testing engines for long-range missiles. North Korea announced before the Singapore summit the suspension of its intercontinental ballistic missile testing and also closed its nuclear bomb test site, where it conducted several explosions in front of visiting media that it said were to destroy testing tunnels. US officials, however, have cautioned that such actions are reversible. At the Cabinet meeting, Mr Trump acknowledged that “things can change". “Personalities can change. Maybe you end up with conflict. Maybe you don’t,” he said. He said both he and Mr Pompeo had established a “very strong” relationship with Mr Kim that he thought would lead to “tremendous success". Mr Trump went on to say that the “number-one statement” in the document he and Mr Kim signed in Singapore was “we will immediately begin total denuclearisation of North Korea", although there was no such statement in the text. In the joint statement, Mr Kim “reaffirmed his firm and unwavering commitment to complete denuclearisation of the Korean Peninsula", but made no reference to a timeline. Going into the summit, Pyongyang repeatedly rejected unilateral nuclear disarmament. Mr Pompeo said US allies and North Korea’s neighbour and ally China were supportive of the US policy of maintaining sanctions on Pyongyang until its denuclearisation was complete. Mr Trump repeated his thanks to Chinese President Xi Jinping for supporting sanctions, although he said that the border between China and North Korea was “getting a little weaker now". “That’s OK. That’s OK. But we have to get him to keep it tough,” Mr Trump said. The president also said the remains of US troops missing from the Korean War were in the process of being returned to the United States from North Korea, correcting a statement he made a day earlier. Mr Trump said on Wednesday that the remains of 200 American servicemen had already been sent back, following on from the agreement he reached with Mr Kim in Singapore. Two US officials, speaking on condition of anonymity, said that while North Korea was expected to return the remains of soldiers in coming days, they had not yet been returned.